It has been such a long time since I've shared some of my favorite daily beauty items with you guys and considering much has changed since then, I knew this roundup was long overdue. 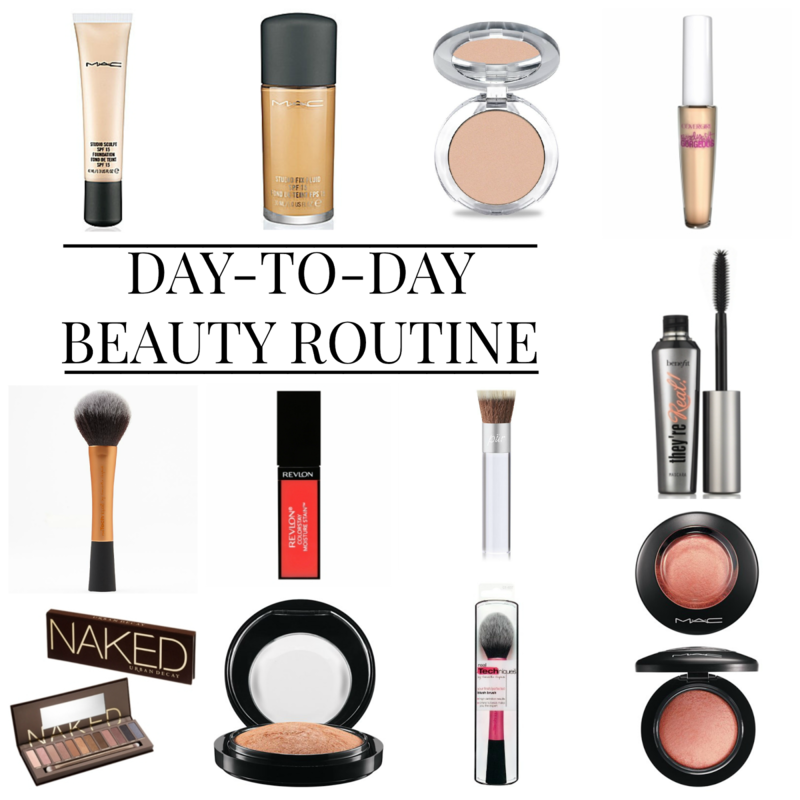 For starters, I just want to say that most of the makeup products (especially face products) I use are all oil free. I literally have the most sensitive skin so I have to stay as far away from oily products as I can or a breakout will happen. After trying many, and I mean many foundations, I finally found one that works for me. Well, actually two. The MAC Studio Sculpt is definitely my everyday foundation (I wear N20). Although it goes on pretty thick, it works really well with my skin and does an amazing job when it comes to coverage. I recently purchased the MAC Studio Fix because I wanted something a little lighter for days when I am not so dressed up. After I apply the foundation, I usually go over top with Pur Minerals Pressed Powder to make for a fresh, finished look. My all time favorite face brushes I use are the Real Technique's blush and powder ones. I seriously own about five of each, they are that good. Also, they are reasonably priced. When applying the liquid MAC foundation, I use the Pur Minerals Liquid Chisel Brush and sort of buff it on. This way I know I am getting the most coverage I can. Once I am finished applying the foundation, I use a concealer by Covergirl and blot under my eyes to help with dark circles. I make sure to buy a lighter color concealer than my foundation which helps brighten my eyes. Then, I apply my blush and go over the blush a little with MAC Mineral Skinfnish Glow. Lastly, I apply Urban Decay Naked eye shadow (I mainly use the colors 'Half Baked' & 'Toasted'), mascara, and a dab of lipgloss. It is such a simple routine that doesn't take me long to do at all. P.S. I always love buying/trying new makeup, so if any of you have any tips or suggestions on what you wear, feel free to share!